Good news: for anyone who couldn’t quite grasp the scientific simplicity of the Geek/Nerd/Dork Venn diagram, here’s the difference between nerds, geeks, and dorks explained by comic characters. This Chuck & Beans comic from Shoebox Blog comes via Gizmodo, whose inner nerd has outwardly dorky tendencies. 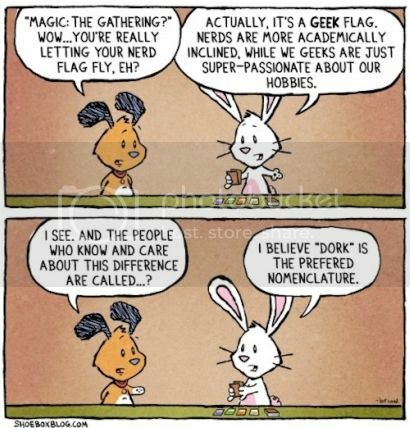 Want more comics about nerds and geeks? Check out one of the all-time-great compilations of comic strips for and about nerds and geeks in xkcd: volume 0. It’s a collection of fan-favorites from the uber-popular xkcd webcomic, with plenty of additional doodles and notations in the margins from author Randall Munroe, a former NASA roboticist and best-selling author. So good. So nerdy. FINALLY! An explanation I can understand!! Yay… I’m a Geek works for me. Except that is wrong. A geek is actually related to Simone that is into electronics and tinkering. Best anology a nerd is someone that dreams of using a transporter. A geek is someone that tries to make a transporter. A dork is the person corrects the comic that gets it wrong.